Written by Frank Twomey and Pakie O’Callaghan the play began life as a radio soap on 96 FM and immediately grabbed the attention of Cork audiences. The stage version of “Surviving Santa Ponsa” became one of the most successful home-grown comedies in the Everyman Palace Theatre’s history. “Surviving Santa Ponsa” charts the adventures of two hapless Cork couples. With their husbands locked up in a Spanish jail, the two “auld dolls” have acquired two million euro by rather dubious means! Suddenly frolicking in Brown Thomas, luring TV celebs into their homes and all the while under the close scrutiny of ruthless villain Hans Von Snicht. Will spendthrift Noreen and nymphomaniac Carmel have spent the dosh and done the dirt before Finbarr and John get out of the slammer? The excesses of Celtic Tiger Ireland are put under the spotlight and mercilessly lampooned in this wildly funny show. “Surviving Santa Ponsa” is directed by Michael Twomey, with set design by Lisa Zagone, lighting design is by Paul McCarthy and sound design by Barbara Szecsenyi. Tickets for the Skibbereen show are available in advance from Thornhill Electrical, telephone 028-22557, or at the Town Hall box office from 7.30pm this Friday evening. Plenty of fun in Autumn 2007 Skibbereen Town Hall schedule! Nicola Hollinshead as Shirley Valentine, performing at Skibbereen Town Hall on Wednesday October 18th. The autumn theatre season continues at Skibbereen Town Hall on Wednesday, October 18, with New Theatre’s production of the Willy Russsell comedy “Shirley Valentine,” starring Nicola Hollinshead in the title role. She is directed by Ronan Wilmot, who starred in “The Tailor and Ansty” at the Town Hall this time last year and in Gougane Barra the two previous summers. The story is about Shirley, who is a middle-aged Liverpool housewife, stuck in a rut. But when her best friend wins an all-expenses paid trip for two to Greece, she begins to see the world, and herself, in a very different light. Brimming with forthright comedy and pithy observations, Willy Russell’s landmark play about a woman reclaiming her identity and self-confidence reflects many of the challenges of modern life in Ireland today. Native Liverpudlian, Nicola Hollinshead started her professional career at Liverpool Everyman Theatre. 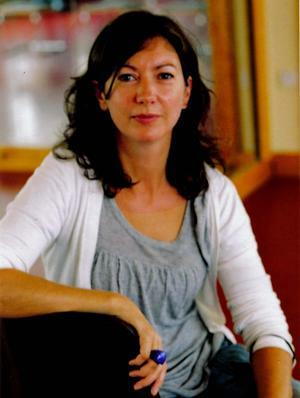 She has worked on the award-winning series”Boys from the Black Stuff” and with Jimmy Mc Govern in “City Echoes” Television credits include “Brookside” and she will next be seen alongside Julie Walters in BBC2’s new drama “Filth: The Mary Whitehouse Story,” to be screened later this year. Tickets for the Skibbereen staging of “Shirley Valentine” on the 18th are available in advance through Thornhill Electrical on 028-22557 and curtain up will be at 8pm. Advance booking is strongly advised for this. 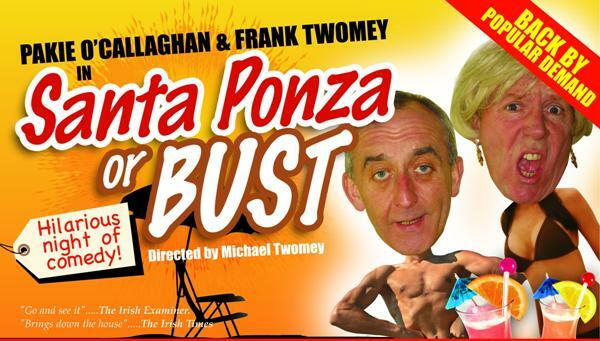 Pakie O’Callaghan and Frank Twomey in their brand new SANTA PONSA show. Skibbereen Theatre Society presents the Bernard Farrell comedy CANARIES. Nicola Hollinshead, directed by Ronan Wilmot, gives the performance of any actor’s life, seducing the audience from the start with a highly individual blend of character, comic observation and self-analysis. Ronan Wilmot establishes a confessional mood- fitting given the anecdotal style of the narrative- and Hollinshead is compelling…. She has a sure grip on Shirley’s feisty, self-deprecating persona, and convincingly segues between coarse humour and touching pathos, giving voice to Russell’s poetry of the vernacular. You will rarely see a better solo performance than Nicola Hollinshead gives in this very funny, beautifully observed and occasionally moving one-woman play. The accomplished performance of Nicola Hollinshead as Shirley will have your memory of Pauline Collins fading as quickly as your memory of last year’s sun-drenched package holiday.